You are not logged in. 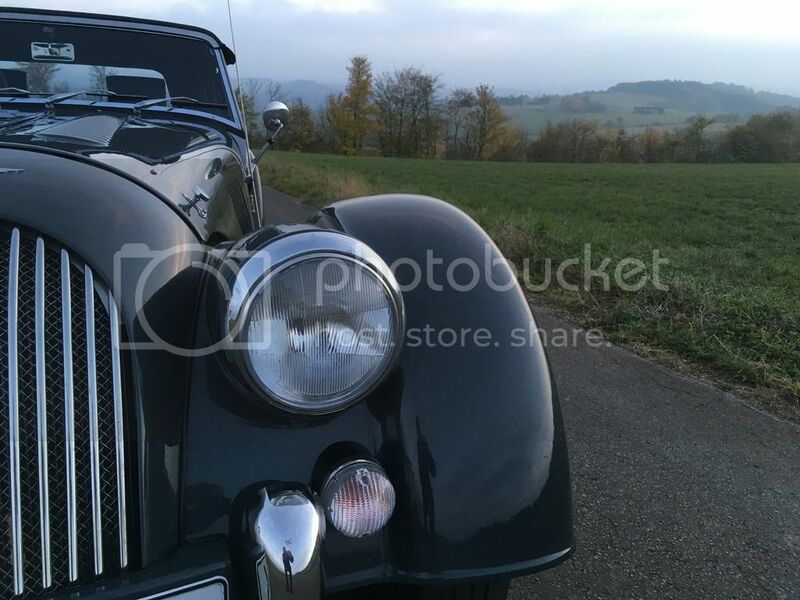 [Log In] Talk Morgan » Forums » Community » The Malvern Arms » Modern Hire car versus Morgan? No contest! The comparison is rather pointless. You are comparing a vehicle that is generally impractical, rides and handles badly ( please don’t tell me they handle better than a modern car🙄) but has character by the bucket load, to a modern practical every day car that is comfortable, doesn’t leak, reliable, well built, generally handles well and doesn’t need suspension greasing . You just cannot compare vehicles but there is room for both. “You just cannot compare vehicles”......................you just did! The comparison just reinforces the enjoyment we (or maybe just me?) get from a car which should have been consigned to the fifties, but hasn’t. Why do those fortunate enough to be able to fly a Spitfire in the 21st century say that it is the best plane ever designed in terms of pilot enjoyment? Sorry, there’s another comparison! Howard makes a fair point about us seeking to justify our decision to own and drive an anachronistic vehicle. But I think there's more to it. Modern life is de-skilling us in many ways and so by driving a vehicle that requires some skill to make it perform well we are bucking that trend. Then we take things further by driving in conditions that require endurance and exposure to the physical world of wind, sun, rain, heat and cold. In doing this we are quite rationally trying to measure ourselves against the men and women we admire; our role models from the past 1.25 centuries of motoring. We want to experience what they did, even though radar traps and multi-lane highways render that a near impossibility. At least we can escape air-conditioning, ABS and lane-keeping systems. I think we all get it, Howard too, because I'll bet that sometimes he's like me and just wants to whoop with the joy of clipping that apex and snicking second gear on the double clutch down shift. Yes but if you wanted to fly four people economically somewhere you wouldn’t choose a Spitfire. Just as if you wanted day to day transport you wouldn’t chose a Morgan over an everyday tin top . I don’t feel the need to justify enjoying driving a Morgan (or similar) just as someone who doesn’t shouldn’t have to justify their lack of enjoyment and I respect their opinion. I’m just glad My DNA put me in the like group and not with the unfortunate others! I have an objection at one point of your insightful text. I avoid such modern multi-lane highways. At least in my surroundings there are still the roads, which let enjoy all the beauty with a Morgan. To look at it philosophically, we (or many of us) also use the Morgan as a vehicle in a figurative sense. Not only as a machine to move, but above all as a world of experience that expands our senses, in contrast to the uniformity of a modern car that stands for objectification and against intense experience and is on the same line with a lot of what determines life now. I think as you get older 'economically' is way down the list of priorities! We are the lucky ones who can afford to play with Morgan's and have the luxury of having ordinary cars for ordinary everyday usage. The majority have other financial priorities and for many it is easier to knock something than to admit to oneself that really one would love to have the experience but cannot afford it. Howard as a fellow Yorkshireman and as someone who was educated by Jesuits (and survived !!!) I understand your torment and confusion. Stoneyhurst? I had a pal at college from there and he certainly was a bit damaged by the Jesuits. Not that I'm suggesting you are. I agree with Ewn I believe you have lost the joy in seat of the pants motoring..the pleasure of going on mad jaunts like my wet trip down from Newcastle just because I could. I often do 100 mile bike rides to hurt myself a bit (the Jesuit influence !!) and feel great afterwards..indeed after writing this I will bike 70 miles to Humber Bridge ,stand on the top ,amd say a prayer for you !!!! There will come a time when I am not fit enough to do these things so I savour every trip..it makes me feel ALIVE !!! Howard..say three Hail Mary's and 12 Our Fathers and you will be absolved.!!! I can understand what you are saying - after all, racing my boat in strong winds and blowing rain every week from january to April is the same sort of thing albeit less energetic. But you cant race a yacht without being exposed. You can drive a car without the hair shirt. Sorry but I just dont see the point in not taking advantage of modern technology. And by that I dont mean heated seats or bluetooth, I mean proper independant suspension, proper dual clutch box,lightweight rigid body structure, modern tyres , disc brakes etc. In other words Lotus Elise or ( if you can stomach buying French) the new Alpine. Sure I hanker after another Fezza but I know that to buy one would be stupid. Its only about the badge really - no point in a 200 mph car when even being naughty, you arent going to exceed 100. Howard too, because I'll bet that sometimes he's like me and just wants to whoop with the joy of clipping that apex and snicking second gear on the double clutch down shift. Absolutely right - its why I miss the Lotus so much. The sheer pleasure it gave down a windey road or the grin from overtaking some fat Beemer round the outside on a roundabout. And that was what was wrong with the Fezza. Not that it couldnt do the same things but that it was too ballistically fast to use to its potential, and the consequences of making a mistake were potentially too expensive. You know how to be cruel!